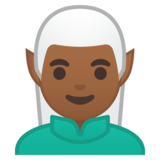 This is how the 🧝🏾‍♂️ Man Elf: Medium-Dark Skin Tone emoji appears on Google Android 8.0. It may appear differently on other platforms. Android 8.0 was released on Aug. 21, 2017.